For whatever reason—most likely, the heavy late-19th-early-20th-cenutry influx of German, Dutch, Belgian and other immigrants in the area—there are a high proportion of old-fashioned, quality, family chocolate shops in the towns of the Fox River Valley, nestled around Lake Winnebago in central-eastern Wisconsin. Among there are Seroogy's in De Pere; Beernsten's, a wonderful old soda fountain in Manitowoc where you can also sit in a booth and enjoy a cheap lunch of bratwurst and chips; Oaks, a century-old candy shop in downtown Oshkosh; and Hughes Chocolates, an unfathomably quaint chocolate factory situated in a white clapboard family home on a suburban street. (The New York Times called it "a figment of Wisconsin's imagination.) You walk through a side door down to the basement, where you can buy plain white boxes of bulked chocolates (no fancy individual wrappers) from a small counter in a room so cramped you have no choice but to leave immediately after you make your purchase. Hughes chocolates have been a Christmas tradition in my family for decades. Back in June 2010, I puzzled over this sign at 30 E. 29th Street in Manhattan. 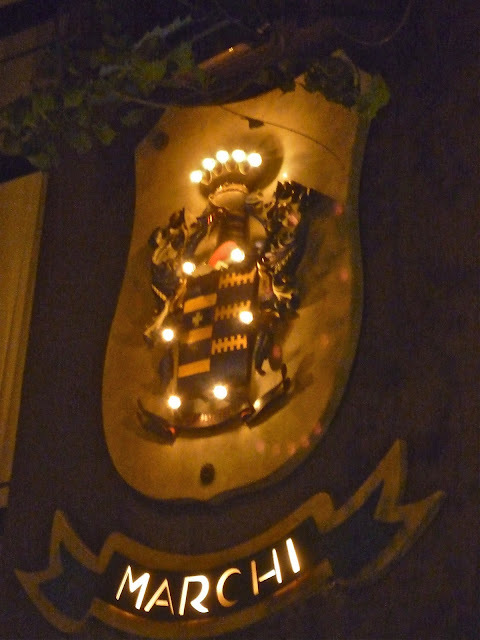 It seemed so much older than the restaurant, Campanile, that sat under it. Recently, a regular reader, the author of Project Neon, wrote it to tell me she had cracked the case. It used to be called the Weathervane Inn. 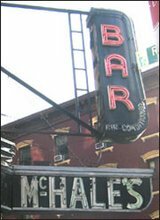 It was founded by Nat Levine, an immigrant from Poland, who moved here in the 1920s, and ran a place called The Milk Bar on Nassau Street prior to opening the Weathervane. Patrons included Joe Namath, Lauren Bacall, and Joe Louis. The Levines liked the sign as much as I do. To wit: "The neon sign was considered important enough that they carried a service contract that meant the minute a single letter went out a service person immediately came to fix it." If only such devotion was more evident today. This inset phone booth is probably not as old at Marchi's restaurant—1929—but I bet it's at least 50 years old. 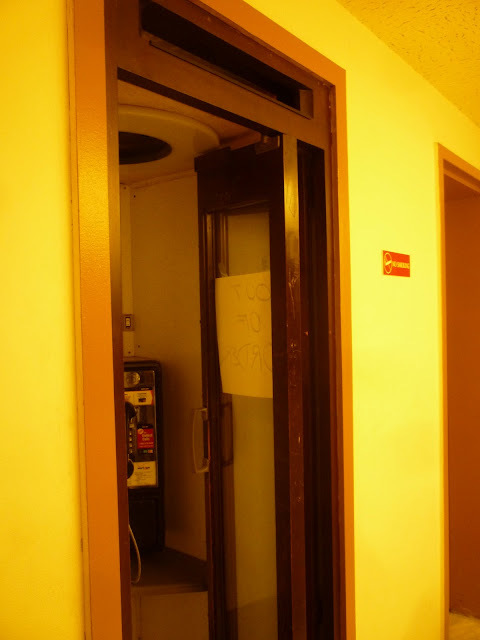 Unlike the other booth in town, it still has its phone. You can get a dial tone, but you can't make a call. Marchi's. An extra-long meal; an extra-long "Who Goes There?" column. Not a bad place to go at Christmastime. There's a tree, a million nutcrackers and they play Christmas music non-stop. Labels: Marchi's, Murray Hill, who goes there? Not a good picture, I know. But I had to run it. I love that Christmas trees are being sold in the shadow of the the Russian Orthodox Cathedral of the Transfiguration of Our Lord on N. 12th Street in Williamsburg, Brooklyn. Looks like a scene from Russia. I don't know which bakery in the Belmont area of The Bronx is the best. But I know which one is the most beautiful. Addeo Bakery. This is hands down the best neon sign for a carpet stores I've ever seen. S.M. 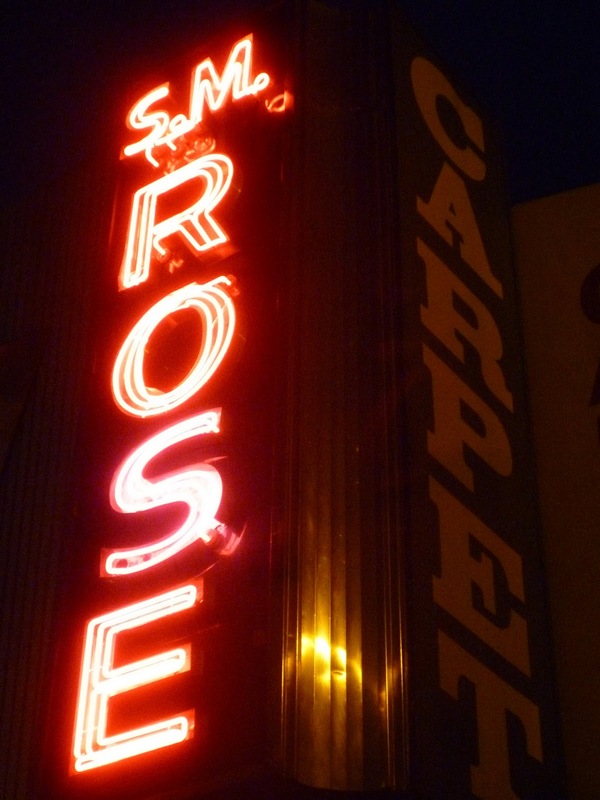 Rose is on Fordham Road in The Bronx, near Arthur Avenue. I was a bit confused by the huge metal Chevrolet logo on the side of the building. Until a found a listing of Rose that described it as "associated with following industry(s): Used Car Dealers - Automobiles, Used Cars Only, Floor Covering Stores - Carpets, Retail." This building at the corner of Church Avenue and Rogers Avenue is interesting enough in contemporary terms, since it is the home of Nio's Trinidad Roti Shop, a restaurant of some local renown. One Nio Badall founded the Trinidadian eatery some quarter century ago. But I am more interested in what the building was before that. The sprawling, two-story, brick, corner edifice is so obviously an old structure—with its peaked cornice, oval window and decorative lintels—that one imagines it was a significant local landmark going back as far as one hundred years, if not more. Alas, I have found out nothing about this building aside from the fact that it was a restaurant back in 1935. Anyone out there have any information? Would You Get Your Taxes Done Here? On a lonely sidestreet off Church Avenue in Flatbush, in a low-slung, oddly built brick building that may have been a stables of a small factory, is an accountant with no name and an unprepossessing address. I picture motley surroundings upstairs, a low ceiling, cluttered desk and an old, wily, not entirely trustworthy may in an unbuttoned vest and eyeshades. Bill Sikes might get his taxes done here. If Bill Sikes ever did his taxes. In Astoria since 1969. 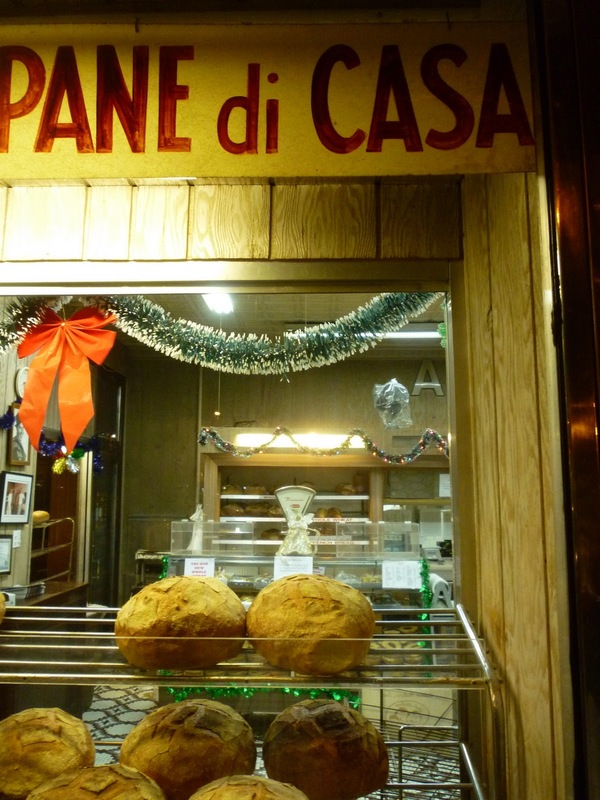 Not to be confused with the Parisi Bakery in Little Italy. Is this the grandest McDonald's in town. It's certainly in the running. 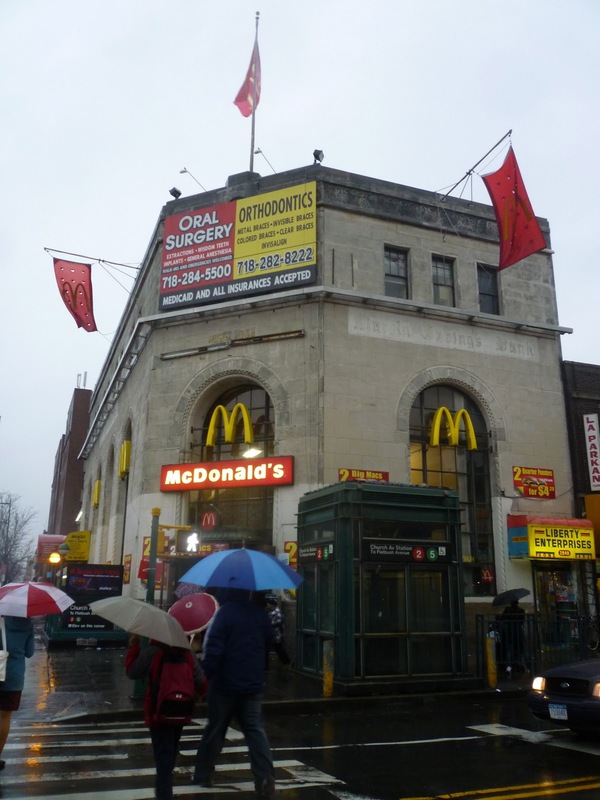 This Flatbush Mickey D's is situation inside an old branch of the Lincoln Savings Bank built in 1932. It's four stories tall, granite, with large, three-story, arching windows. 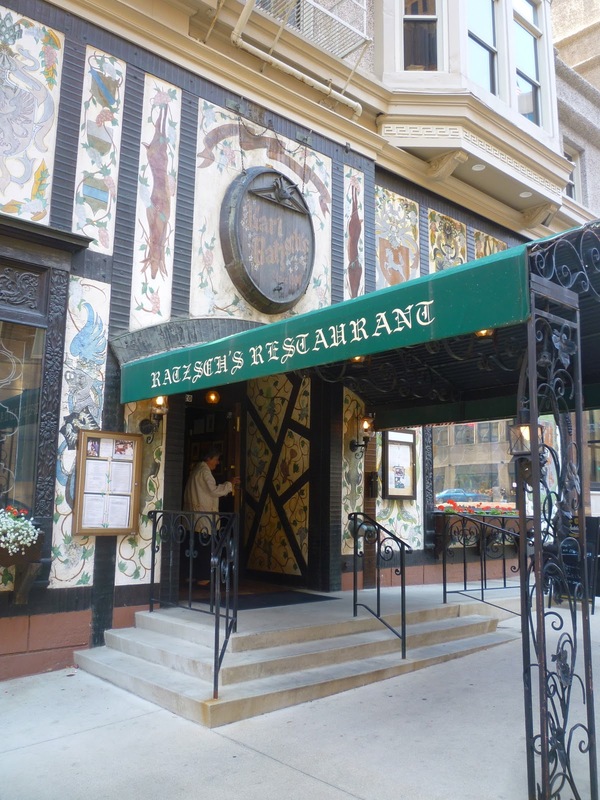 Karl Ratzsch's Restaurant loomed large in my Milwaukee childhood. The old German downtown restaurant was where you went for special occasions. 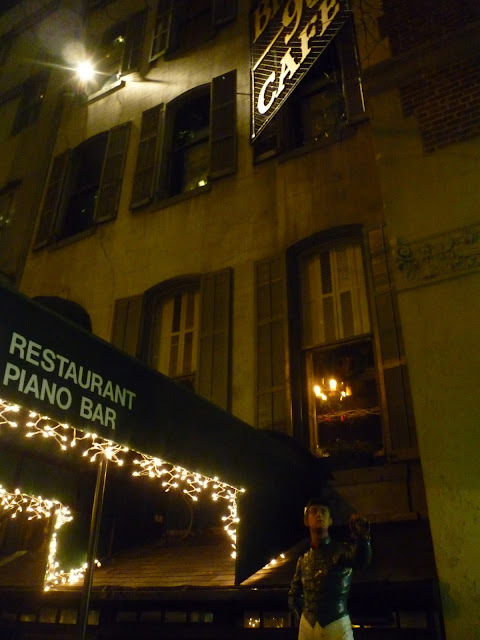 It's name evoked the kind of awe in a kid's mind that perhaps The Four Seasons and the "21" Club still do in New York. I remember going only seldomly, and being jealous when I heard of others going. In particular, my wealthy aunt and uncle's family's habit of going to Ratzsch's every Christmas day before coming to our house—and not inviting us to join them—was an annual source of frustration and anger to my mother. I hadn't been to a reweaver since I wrote about (and thus discovered) the trade for a New York newspaper about four years ago. And I missed it. The vanishing trade is so old-world-immigrant, so idiosyncratic, so invisible to everyday view—and, also, so necessary!—I couldn't help but love it. Reweavers are relics of a thriftier, more sensible time, when people actually had their old garments mended and darned. They are a rebuttal to our diseased, disposable lifestyle. I had a couple beloved sweaters that had a hole or two; it was time. I grabbed them and headed to midtown Manhattan. Last time I checked there were still three or four reweavers around. The oldest, by far, is Alice Zotta. Like all the other reweavers I know, she works out of a cubby hole on a high floor of a highrise. Hers is on W. 45th, near Fifth Avenue. Last time I visited, little Alice was still on the job, as she had been for 70 years. She has since retired, I was told, but the company continues, run now by her daughter. Otherwise, the "enterprise" is the same. There's a small, anonymous vestibule, and you conduct your business through a doctor's office window, passing your garments through to a woman, pointing our the spots that need repair. They're a salty group, the reweavers. Dyspeptic, unsmiling, truth-tellers. They'll let you have it in no uncertain terms. "I don't know if we can do this," they'll begin. "This is a big job." "This might be impossible." "This is gonna cost you." "Are you sure you want to do this?" Comments like that. They really do their best to turn you away. You have to pay in advance, because, as the worker told me, "We've been burned to many times." Zotta's office is filled with clothes people have left and never paid for. I'd go to the reweaver more, but the work does cost a lot. The reweaving of one smallish hole will run you $50, and many jobs start between $70 and $100. So you better goddam love that suit or pair of pants to pay the sort of money that could easily buy you a new garment. I did love these three sweaters. But one had been attacked by moths so viciously I was told it would cost $200 to repair. So, with a sigh, I abandoned it to the trash. The other two, however, I decided to save. I'm looking forward to picking them up. Zotta always does peerless work in a dying craft. 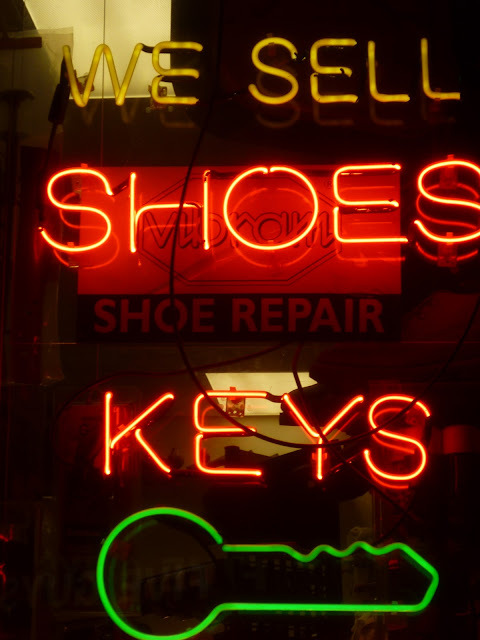 This has got to be the flashiest key-maker-shoe-shop-jewelry-watch-repair store in the City. Every single little nitzy thing this tiny Flatbush business does is emblazoned in light. Either the owner really likes neon, or he's crazy. 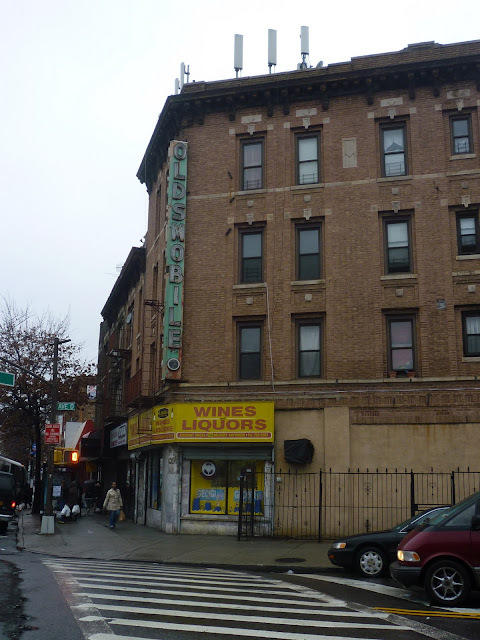 The bold, rather unpleasant sign above this Church Avenue business tells you its it's Willie's Liquors. But look further up and you'll receive the same information in a much more enjoyable package. 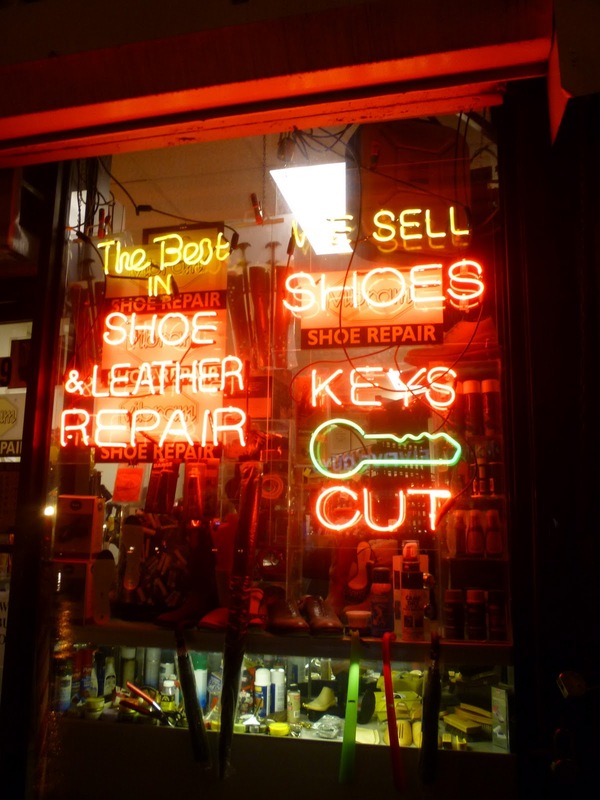 The old neon sign would seem to indicate that this Flatbush business has been around since the 1930s or '40s. 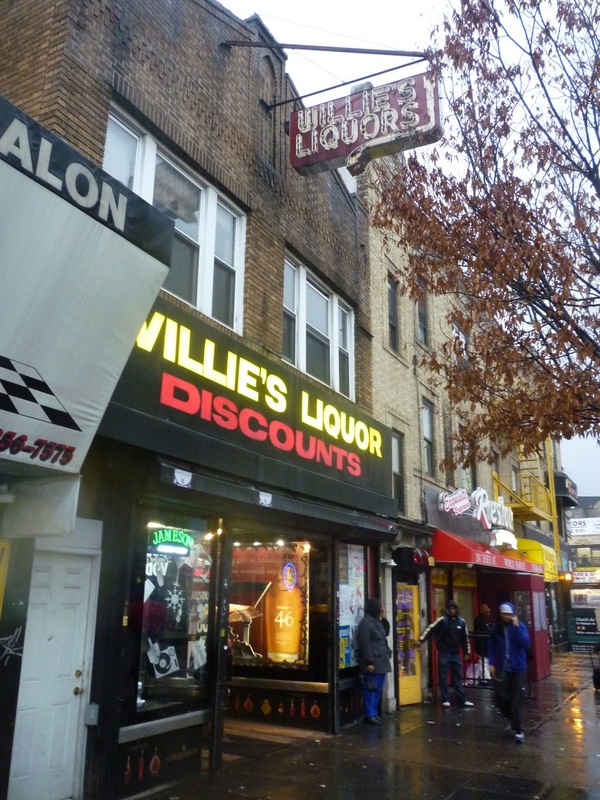 I love that it's called Willie's Liquors—not William's, or Bill's. And I'd love to know who Willie was. But I don't. Despite the signs, this liquor store apparently officially goes by the name of 77 B&C. Utterly charmless. Long live Willie. 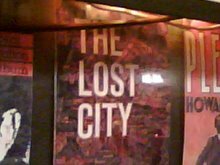 Lost City Asks "Who Goes to Lee's Tavern?" My first "Who Goes There?" column in Staten Island, and ain't I but proud? Yeah, it's called Lee's Tavern, not Lee's Restaurant. And it is a tavern. An old one. It's got an old wooden bar, tin ceilings, tile floors, TVs showing sports matches, serves Bud and Coors, the whole nine yards. So what's it doing in this column? Because Lee's also serves what some think is the best bar pizza in the five boroughs, and has been doing so for decades. And because there are plenty of tables. People find this place and sit down for dinner every night of the week—despite the fact that the blonde-brick building, in this lonely corner of Staten Island known as Dongan Hills, has no signifying features, least of all a sign. Lee's has been around since 1940, when it was founded by Leroy Moresco, known to all as "Mr. Lee." Diego "Dickie" Palemine (everyone has a nickname) bought the place in 1969. After Diego was killed in a hotel fire while vacationing in San Juan in 1986, his family continued to run the bar. Today, his strapping son, also called Diego, does double duty, manning the bar, and walking out to the floor when someone makes a food order. The Lee's menu includes salad, garlic bread and scungilli—all of it cheap—but pizza is the thing here. Bar pies are an odd subset of the American pizza world that typically connote a smaller size, a thin crust and sub-standard ingredients. All of that is true here, except the last one. The ingredients here are good and the skill with which they're put together is considerable. Lee's cheese pie is sweet, subtle and tasty. And the clam pie is as good as anything I've had in New Haven. If you think you're gonna get better at $5.75 and $8 a pie, respectively, you're a putz. I suppose Lee's gets a questing foodie like me every now and again, but mainly this is a Staten Island-sustained joint. If any of the patrons were from outside the immediate area, my social antennae didn't detect them. All the customers strolled in like they had just come from around the corner. Lotsa back-slapping going on here. Fat hands on sweatshirted backs again and again. Everyone knows each other. Everyone knows each other's sister or mother, and they all ask how that sister or mother is doing. 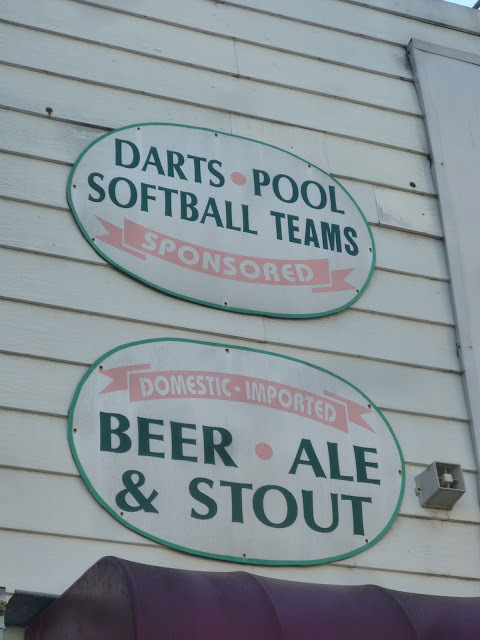 Ninety percent of the drinkers and diners were dressed in athletic gear: track suits, warm-up jackets, sweat pants, basketball jerseys, athletic shoes. That not a single one of them had just come from doing anything athletic was a dead certainty. Staten Island folk don't seem to know that they dress like extras from "The Sopranos" and "Working Girl." Or they do know it, and don't care. Or they do, and are proud of it. I don't know. If I could call Lee's my local pizzeria, I'd be kinda proud too. Labels: Lee's Tavern, staten island, who goes there? I stumbled upon one of New York's oldest butchers the other day during a long rainy walk through Flatbush. 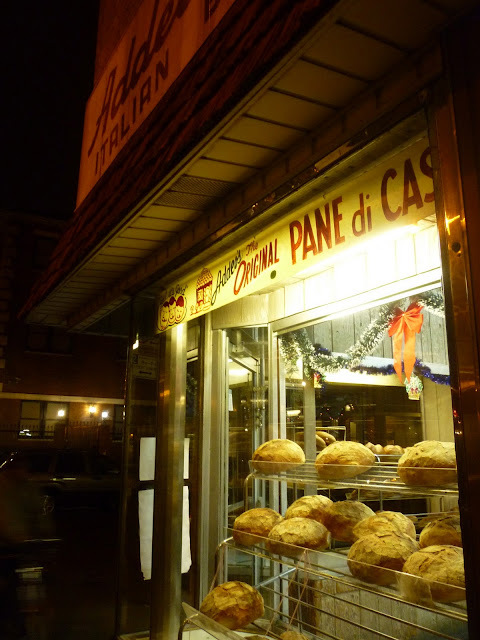 Sitting anomalously in the middle of the various Caribbean and Spanish shops on Nostrand Avenue was Michael's Prime Meats, a remnant of the neighborhood's Italian past. I include this Staten Island bar for several reasons. One, Bigzee's is such a great name for a tavern. Two, you can still see that the place used to be called Donovan's, as nobody has bothered to paint over the sign above the awing sufficiently. And third, because of the odd, oval signs to the left in which Bigzee's proclaims its many attractions. This is surely the only extant neon Oldsmobile sign in New York City. I almost passed it by without noticing, so seamlessly has it facing into the background of visually hectic Flatbush Avenue, near Avenue D.
It's a beaut of a sign, two-sided and three stories tall. Also, the block at the bottom, by some miracle, works. Most certainly, this was an Oldsmobile dealership once upon a time. The sign also used to be red, based on old photos. Last we checked in on the slowly improving, former horror show know as the Rat-Squirrel House, it had lost its cornice and gains a new roof. Now the long-delapidated Cobble Hill residence has a new cornice. It's a crappy one, of course, because cheap is the way to go in these dark days of Gotham development. Looks to be fiberglass. But it's the same shape as the old one. And maybe they will paint it brown or something. Hey, Windows: Why So Round? Walking down E. 85th Street between Second and Third Avenue, I was struck by the unusual roundness of these ground floor buildings. They're not only arches, which is fairly common in older building, but they bulge out at the sides and are abnormally side. 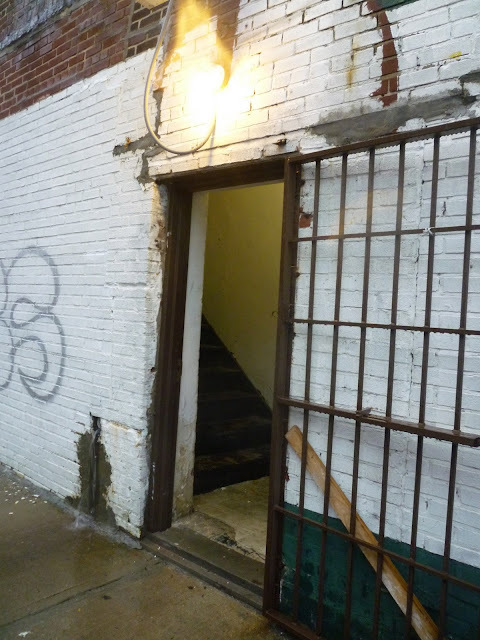 The same is true of the doorways at 222 and 220 E. 85th. 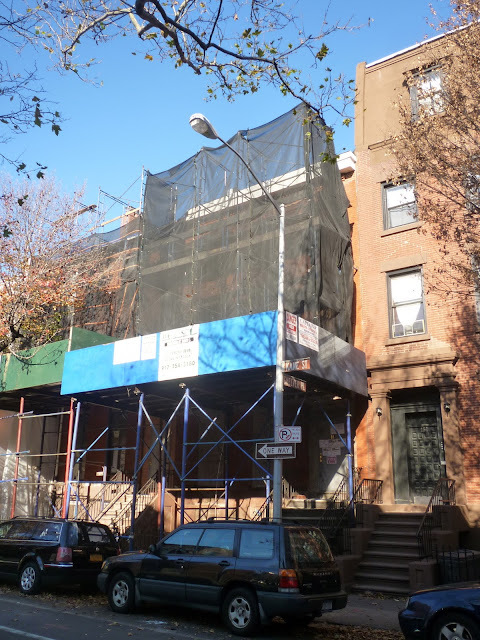 The AIA Guide noticed the windows, too: "Bold, sensuous arches and their batterned bases form, seemingly, keyholes that ground these unusual tenements." The buildings were built in the 1890s, not 1910, as City records erroneously state. 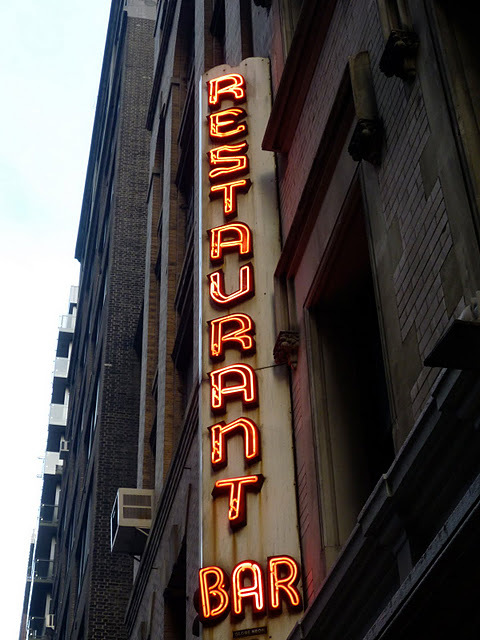 It's the rare New York business that has both great old standard signage and great old neon signage. But Grande Monuments on Graham Avenue in Williamsburg hits that trick. The business was begun in the late '40s and is still family owned. (Grande is not an adjective in this case; it was the name of the founder). It's a weird mash-up place. They sell headstones and bread. The bread comes from Fornaretto Bakery in Brooklyn, where owner Jerry Ragusa's daughter Angela works. It's his way of having her in the business.